Females are renowned for possessing a large amount of ‘stuff’ in their lives, from an array of sparkling jewellery to the endless supply of hair grips and bobbles, which generally find a home scattered across a bedroom, living room or car floor! 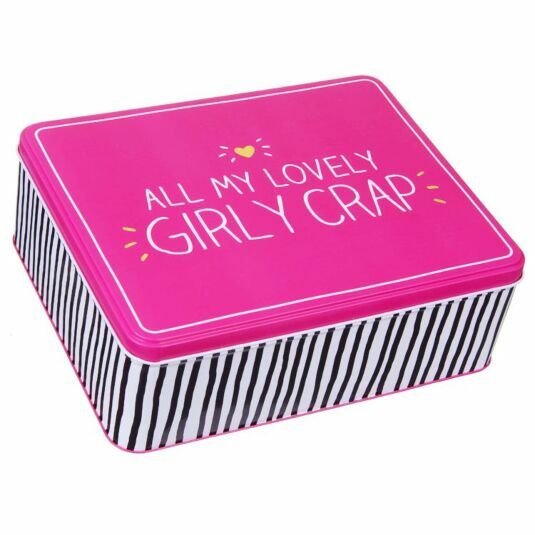 Keep your environment tidy and your possessions safe with this vibrantly designed Happy Jackson Girly Crap Tin! This tin is both large enough for storing a wide array of your belongings from passports to keys, jewellery to hair essentials and collectables to car keys but also small enough to nestle into a cupboard or draw… as long as you remember where you put it! 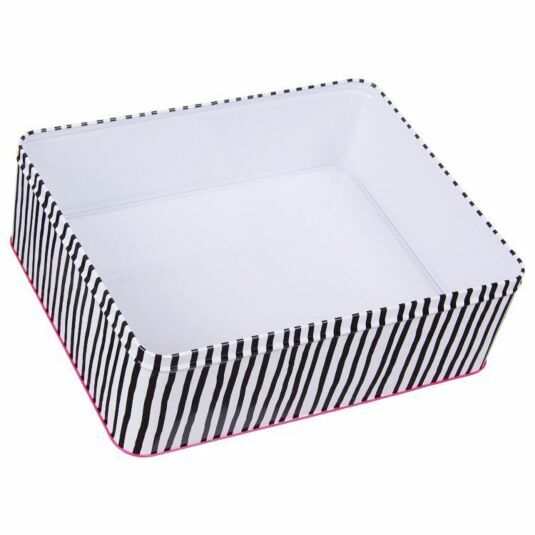 Vibrantly coloured in a combination of pink, white and black, the base of the tin is decorated in a striped pattern of black and white whilst the lid is coated in a luscious pink. The lid itself is adorned with the text ‘ALL MY LOVELY GIRLY CRAP’, in a bold white font, surrounded by yellow glow marks and finished with a yellow love heart. Ensure those treasured items are kept safe and sound in this Happy Jackson Girly Crap Tin, ideal for gifting to that best friend in need of an organisation or just to yourself as means of tidying up your room!